These 33in x 81in printed pull-up banners with stand are ideal for trade shows and retail applications alike. Printed on a 9mil satin textured vinyl media, they are durable and are UV resistant. If it be for trade shows, public/private events, interior or exterior store signage, ZEN x DESIGN can offer you a number of banner printing and display solutions to meet your needs. With exceptional prices and a number of mounting options / stands and a virtually unlimited choice of custom sizes, let ZEN x DESIGN find the printed banner solution that will work best for you. 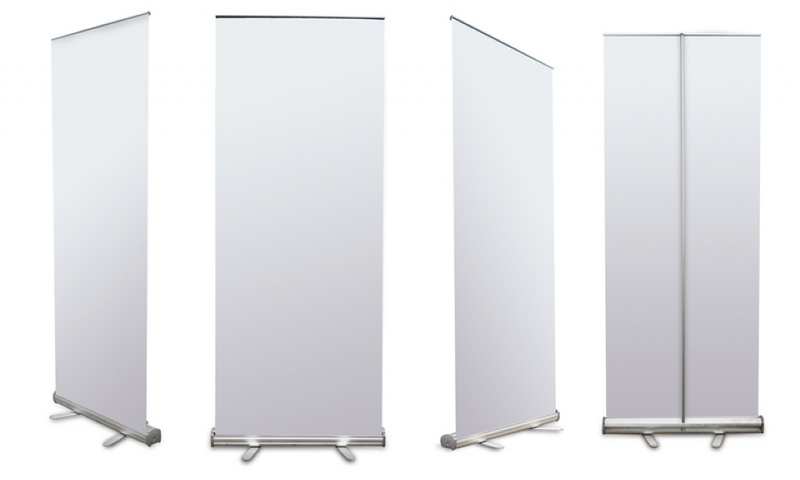 These 33in x 81in printed pull-up banners with stand are ideal for trade shows and retail applications alike. Printed on a 9mil satin textured vinyl media, they are durable and are UV resistant.If it be for trade shows, public/private events, interior or exterior store signage, ZEN x DESIGN can offer you a number of banner printing and display solutions to meet your needs. With exceptional prices and a number of mounting options / stands and a virtually unlimited choice of custom sizes, let ZEN x DESIGN find the printed banner solution that will work best for you.